You can never escape the fact that one day you too will stand proud as a grandmother or a grandfather. You might think, “Oh! That’s a long, long time away! I’m still young, why should I think of the golden years now?” That’s true, you’re young (even at early 40s! :p), but someday you will get there, we’ll all get there – the golden years of our lives. Imagine at that time, your family isn’t as connected to you as you wished they were? What if, at that time, your grandchildren enjoyed being left alone than being around you? I hate to mention this, but from where I come, people move on faster than they can ever imagine. Being a mother, I sometimes see my children and wonder, “Would this kind of environment have any effect on how they would treat me when I grow riper than the ripest banana?” I’ll be honest, it scares me, yes. Talking about myself, I’m still connected to the spirits of my late grandparents – for all I remember, they loved me, they cared and they were there for me. I still hold close a picture of them holding me when I was born! The smile on their faces melts my heart even today, and I thank them every day for making me possible! 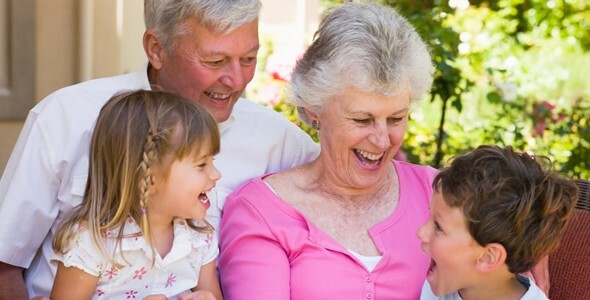 Learning to stay connected with grandparents is very important because as people grow in years, they seem to want more care. They love being surrounded by people they love and care for, they love the idea of being an important person in the family and they love to be listened to and talked to. Who wouldn’t? Imagine a life where you have your entire family out in the garden, smiling and joking and you, the grandparent, are silently sitting inside because no one invited you out…heart-breaking isn’t it? Let’s remember our grandparents and let’s learn to connect with them so they always have a smile on their faces! Oh, and this is definitely going in my children’s Reading List! Take some time out and go through photo albums together, trade stories about family members and ask how they felt that very moment. My grandmother had a huge box of photographs and it would take me over a couple of hours to finish seeing them! The best part is that my grandmother remembered each and every moment, like it happened yesterday! She would tell me what transpired and what led to the photograph, which would magically take me back in time to see it happening again. What do you and your grandparents like doing? Whether it’s cooking, knitting, painting or sewing…pick something and share activities that you enjoy as a group. I taught my grandmother how to search the YouTube for her favourite videos and even showed her how to download it on the desktop! She also learned how to locate services on Google Maps and call in case she needed them. Boy did she love to order new scarves! If you think you can visit your grandparents every Sunday, do so every Sunday without fail. If you think you want to have dinner with them every Saturday, do so without fail. Maintain your family traditions so they have something and someone to expectJ. My grandmother always knew that Fridays were my days, so she would bake my favourite cookies and I would gift her, her favourite flowers. It was fun and I admit, I miss those times…Family traditions can provide an aged family member an opportunity to socialize and stay connected with family members, which can help minimize the feeling of being lonely or isolated.